You aren’t seeing the magic above because your browser doesn’t yet support 3D transforms. Try using Chrome or Safari. Katrina recently was part of a panel on mixed-race identity at the Brooklyn Historical Society where she spoke about her project, FishBird. While discussing ways to remount the piece and additionally create a rich, digital component to accompany it, I began tossing around visuals. I couldn’t really get the idea of the wooden blocks out of my head. 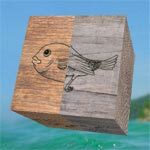 A basic rubix cube of sorts with various of animals that would rotate to create fishbirds, cowmonkeys, and beariguanas. Something that looked handmade – a game for children to experiment with.